Cockroach infestations can grow rapidly so early treatment is essential. As well as numerous health issues, one of the big concerns is food contamination. Cockroaches can introduce Salmonella and other bacteria that can cause life threatening food poisoning. There are two types of cockroach you might come across in London Essex and Hertfordshire. German cockroaches are easier to spot due to the places they live in. In a kitchen you might find them in cupboards, behind fridges, under sinks and around boilers. You may just find the faeces they leave behind in cupboards or behind appliances and worktops which just look like small black dots. 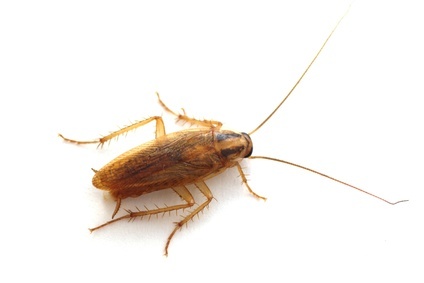 The Oriental cockroaches are more likely to be found in damp and humid conditions like you might get in basements and cellars. They prefer these conditions as they lack the sticky pads on their feet but they are often much more difficult to treat as they generally live within hard to reach areas of the building. With cockroaches an extra third visit is often required. The pest controller will identify the cockroach species before he carries out any sort of treatment. Once the cockroach species has been identified, the correct course of treatments can be applied and the right areas will be targeted.